High School Football season is over, but man what a season it was!! Going into this year a lot of folks were apprehensive about the new classification system. Moving to a new system with 5 classifications, in which not all teams would make the playoffs like they had in previous years, (except in 3A where you’ve always had to win region games to get in). I think the new classification system added some drama and made some late season games a lot more entertaining. Who would have thought we would be at a point where Gaffney played Byrnes and the loser of the game would not even get in the playoffs?? I Just wanted to share with you some of my thoughts on the 2016 high school season. Region 3 5A was fantastic as advertised. Boiling Springs was a lot of folks preseason favorite to win this region. We knew they were going to be good. I’m not sure we really knew how good Coach Tate’s team was. Led by QB Mason Streater, Wide Receiver Will Brown, a very deep offensive line, and one of the fastest defenses we have seen in a very long time, this team made school history for most wins in a season, first region title, and first appearance in a State Championship game. Although this team came up a little short in that State Championship game, they should be very proud of all they accomplished this year. The Bulldogs were very impressive on both sides of the football and they successfully took Boiling Springs from a perennial bottom dweller in this region, to not only a contender but a champion. The future is bright for Boiling Springs. The Spartanburg Vikings had a lot of questions to answer about themselves coming into this season. They had to find a lot of new stars on both sides of the football. They did just that, most notably at the quarterback position. William Yex ended up being a good QB for the Vikings. He struggled at times but he also played very well at times. The Vikings outperformed a lot of people’s expectations this year. The Vikings lost one region game, to region champ Boiling Springs on the head to head tie-breaker, defeated crosstown rival Dorman twice, and made it all the way to the upper state title game. The Vikings have a lot to build on for next year. While they will have to find a new QB for the second straight year they are returning a lot of talent, especially on the defensive side of the ball. Next year the Vikings will need players like Connor Shugart, and Damyjai Foster to step up and be leaders on the field. The rest of region 3 5A…. Dorman lost to crosstown rival Spartanburg twice, Byrnes, who didn’t make the playoffs, but they were able to beat region champ Boiling Springs. The Cavs had a hard time stopping the big plays this year. They did show some flashes of being pretty good and QB Jalen Fowler provided defenses with a lot of trouble this year. He will be tough to replace for next year . We knew that both Byrnes and Gaffney would be a little down this year. Byrnes missed the playoffs for the first time since 1999. The Rebels are now looking for a new head coach. Several names have been mentioned, among them are Chapman Head Coach Mark Hodge and Woodruff head coach Trey Elder, a Byrnes Grad. 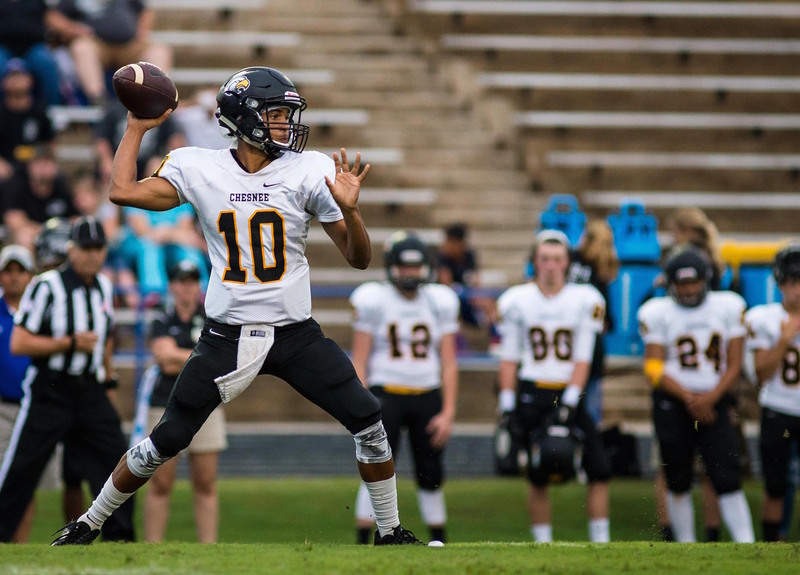 Gaffney had to find a new starting QB this season, and they found a good one. Tyshun Sarratt looked really good at times this year leading the Gaffney offense. The Indians snuck into the playoffs then knocked off top seed Northwestern. Sarratt will return for his senior season and the Indians will be playing with some confidence, could be a dangerous team. Union County got a new head coach. Bradley Adams took over from the departed Coach Steve Taneyhill. The Jackets were coming off an appearance in the upper state championship, and expectations were high. All eyes were on Shi Smith, a Gamecock commit, who was entering his senior season. Smith performed well as did the Jackets in region play. Union County captured the region 2 4A title going undefeated in region play against a Greer team that was way down, Travelers Rest, and Blue Ridge. However the Jackets were eliminated early from the playoffs with a home loss in the 2nd round to Ridge View. The Jackets will lose Smith, as well as their QB and several more starters going into next year. Coach Adams will have his hands full in year two. No surprise that South Pointe won the 4A Title. They continue to pump out the best athletes in the state year in and year out. Just like region 3 5A we had very big expectations for region 3A. This region was absolutely loaded with good teams full of talent. Unfortunatly one of these teams had to be left out of the playoffs too. Chapman- Going into this season we knew Chapman would win a lot of football games. The Panthers had a lot of talented players returning at the skill positions. DJ Twitty, Colton Bailey, Richard Tucker, and others looked to take the Panther to a new level. They did just that. Chapman finished second in the region behind Newberry then had a chance to avenge that loss in the playoffs. DJ Twitty had an amazing season eclipsing 2000 yards and became Chapman High’s all time leading rusher in his junior season. Colton Bailey had a really good season at the quarterback position, breaking a lot of passing records for the Panthers. Chapman had an amazing playoff run that culminated in the team claiming the school’s first ever Football State Championship. The scary part about this is most of those star players are just juniors, which should prime the Panthers for a run at back to back state titles. The Woodruff Wolverines had a very inconsistent season. It seemed to me that they weren’t really able to find their identity at times. However as the season progressed the team got better and better. Unfortunatly for the Wolverines they ended up finishing 4th in the region, which meant they had to play a one seed in the first round. They drew the unfortunate privilege of having to go to Victory Village in round one and take on an always talented Fairfield Central team. If Trey Elder doesn’t get the Byrnes job, look for Woodruff to improve next year. Broome. Broome started off the season with a loss to Chesnee. Then they went on a great winning streak that saw them knock off 5A Byrnes for the first time in school history. Then bad luck hit. Start running back and linebacker Demarco Jackson went down with a season ending knee injury. They would go on to lose 3 of the next 5 games and miss the playoffs. I hate to harp on what could have been, but if Demarco Jackson doesn’t get hurt the Centurions could have won this region, and maybe more. Demarco was a finalist for MR. Football, and a shrine bowl selection. I wish we could have seen his senior season play-out with him healthy. Chesnee was a story of two guys named Isaiah. Quarterback Isaiah Ellis was very impressive as the kind of duel threat QB that most offensive coordinators dream about. Over 2000 yards passing and almost 650 on the ground he was a nightmare for defenses. Isaiah Morris complemented his abilities with a great running game of his own averaging nearly 100 yards per game. It wasn’t enough to propel the Eagles through the playoffs as they were eliminated in round one. Landrum was a team that improved vastly as the season went on. Their freshman quarterback was injured to start the season, but when he came back this team played very good at times. With a tough defense they were able to get wins against rival Polk County and a win over region champion Blacksburg. The Cardinals earned a playoff birth, which was one of the team’s goals entering the season. When next year comes around the Cards will be a year older and should be much better. Coach Jason Farmer has a lot to look forward to in the coming years with this very young team. This season was a lot of fun. I cannot wait until next year!